I needed a duct to connect the angled fan onto the 100 x 40 mm sized power supply. These models gave a much better feel - so I started towards turning these shapes into something more permanent. Initial attempts were with paper mache (or however it is spelt) - but using material instead of paper. OK but a bit flimsy. Next attempt moved to using standard white hobby glue with the material - giving it a week to dry results in a pretty strong, slightly flexible duct. Definitely OK for the job. I now connected up the fans, with the ducting, and the power supply. Pretty dismal airflow - no where near what was happening with the tiny 9000 rpm 40 mm fans originally in the power supply. Pulling things apart further, I found that even the fan simply sitting in the metal frame had pretty poor airflow - removing the frame, and airflow was fine. Some Google-ing shows up that the standard axial fan is no good at handling air pressure. 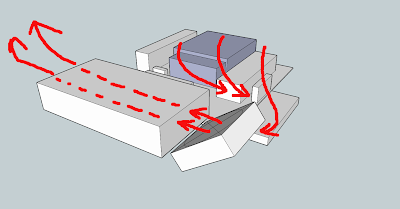 Putting any blockage in the way, means that the fan doesnt want to function well.